Below is a calendar of events that are held in Tuataria – some by the modmin team, others held by community members. We try to pull these from bulletin board posts and other public announcements, but if something you know about is missing, let Allison or Ketie know. Any modmin can also help with the emcee role, signup forms, how to word an announcement, etc. Everything on the calendar on this page displays in GMT/UTC+0. That may mean that sometimes listed as early morning or late night on one day may actually be the day before or after for you, so be sure to convert to your time zone if needed! You may also add the calendar to your OWN Google Calendar which should auto-convert the events into your own calendar’s timezone. Cluesdays are what started it all! John’s hunts are over (at least for now…) but member-created puzzles and hunts pop up every so often, and they’ll be on the schedule when we know about them in advance! You can also join e;assign "Hunt Squad" to get a notification when a surprise hunt BEGINS. Watch parties/listening parties/rabbits/movies/TV shows: These are groups getting together to watch or listen to the same media, often using rabb.it, but sometimes directly in voice. Open Mic “Nights” are held semi-regularly by a whole bunch of members. Polls, announcements, and/or sign up sheets are usually posted in #bulletin_board. Open mics are open to any kind of performance or work, and all members are welcome to come listen and cheer on the performers. 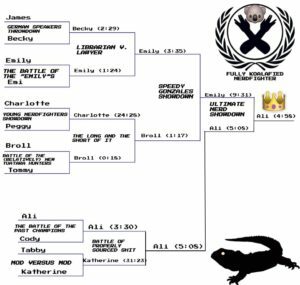 WikiWars Battles are held less-semi-but-still-regularly to determine the Monarch of Tuataria, a ceremonial title that comes with all the honor and prestige you would expect (and your own role color). WikiWars involve two or more people trying to get from one predetermined Wikipedia page to another, using only in-context links. You can watch John Green playing with the Gregory Brothers here. There are also a website that is good for practice, and you can always stop into the Discord and see if anyone wants to do a practice round! 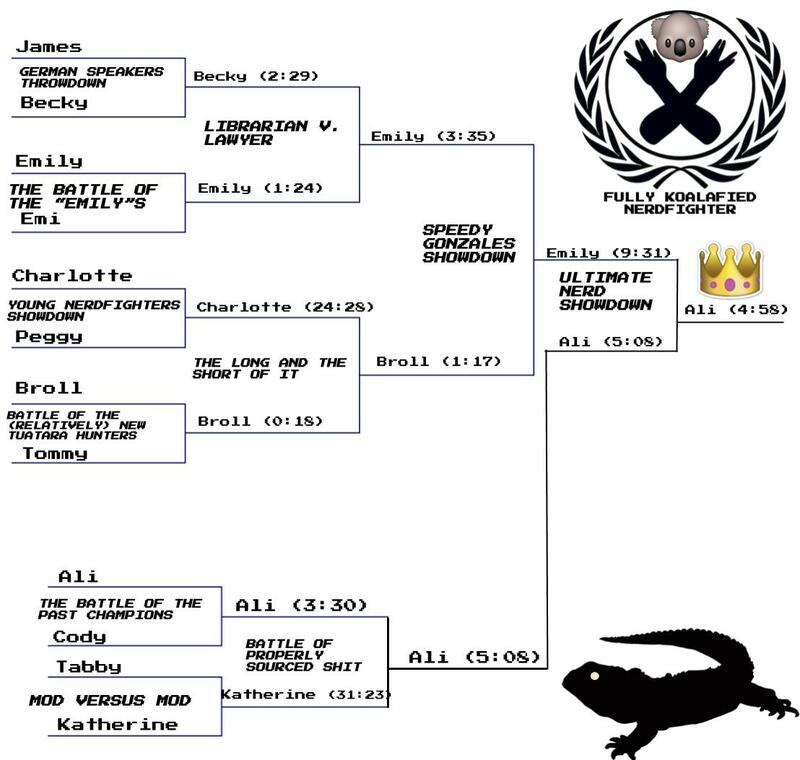 The First WikiWars Bracket, when Ali (alipeli) claimed her crown.